Constantly we have in stock about 250.000 wheels, rims and alloy rims for trailers, TRAILER, CAMPERMOBIL/ CARAVAN. Of course *new* and wheels with currents Dot's. 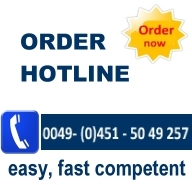 If you aren´t sure or if you have any questions, please call us.